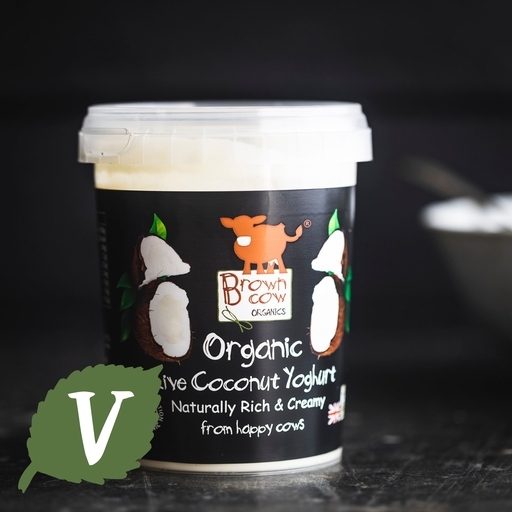 Brown Cow Organics’ live coconut yoghurt is made on Perridge Farm in Somerset with unhomogenised milk from their beautiful Guernsey cows (no prizes for guessing what colour they are). Rich and creamy organic yoghurt with the tropical sweetness of organic coconut; unbeatable for breakfast or pudding. Keep in the fridge and use by the date on the label. Once opened, eat within 3 days. Judith and Clive make these outstanding organic yoghurts on Perridge Farm, Somerset, with the help of a small team of dedicated local people, and their herd of 100 Guernsey cows. They are just as passionate about their ethical credentials as they are about their products: the cows are milked in the morning, then relax for the rest of the day, grazing on lush organic pasture. Their yoghurt is hand-poured into recyclable pots (pumping it would ruin the natural creaminess). No surprise that Brown Cow Organics were declared Champions in Sustainable Farming at the Food & Farming Awards 2016. Unhomogenised natural yoghurt (milk), desiccated coconut (7%), sugar, coconut oil (4%), live cultures.